15 years teaching Religious Education in a Catholic high school has shown me that students, particularly girls, love to hear stories about inspiring women. It is a shame then, that many of the female heroes of the Catholic Church, our Saints, are introduced to children in books as caricatures; one dimensional characters that most ‘normal’ people struggle to get close to. In fact, too often the virtues of the Saints are celebrated to such an extent that it is difficult to relate to them in their humanity. As a consequence, ask any student to do a research task on a Saint and you tend to get a fairly bland recount of what they did (rather than who they were). Furthermore, too often students, when reading the lives of the Saints, will struggle to make sense of the relevance the life they are reading has for their own spiritual journey. 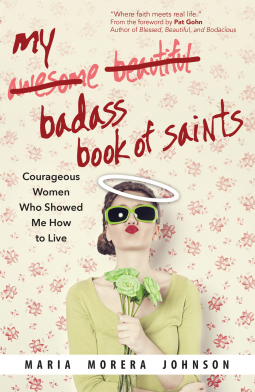 Maria Morera Johnson’s book My Baddass Book of Saints, has written a book about Saints with a difference. Gone are the one dimensional caricatures, instead are depictions of real women, living real Christian lives (often in difficult times and circumstances). While Johnson provides accounts of traditional Saints, such as Saints Teresa of Avila, Joan of Arc, Catherine of Siena, Rose of Lima, she juxtaposes these lives, contrasting them with that of lesser known Saints and women who, while not always canonised, lived notable lives in the same spirit. From this category I was thrilled to see the life of more modern Saints, such as Gianna Beretta Molla along with the lives of women, who while not canonised are worthy comparisons, especially Sr Blandina Segale (whose story could easily have been interchanged with our own Saint Mary MacKillop), Audrey Hepburn, Edel Quinn and Nancy Wake. However, what makes these lives really come alive, is how Johnson identifies common themes for their achievements and, in doing so, connects these to experiences from her own personal story. My Baddass Book of Saints is not the first book of this type to reach publication in recent years, however, it is a solid example. I came across a similar book a few years ago and the experience of this had a profound effect on me and the way in which I now approach Saints in the classroom. While many middle school students may struggle independently to connect with some of the complex ideas in the book, senior students should find the ideas fairly accessible. For teachers, this is a wonderful resource, the perfect starting point for building a broader unit of work exploring notable Christian lives. Similarly, it is a wonderful resource for teachers and school leaders, to deepen and challenge their own spirituality and the provision of reflection questions for each chapter, allow for easy adaptation to professional development and group discussion.